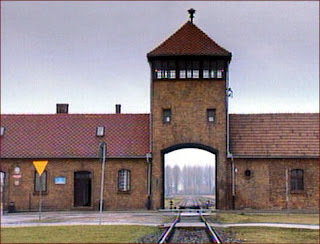 On the 4 April I will be visiting the Nazi concentration camp at Auschwitz. The Nazi's established in Poland a ruthless killing facility that at its peak was managing to send up to 6,000 people per day to their death. The Nazi camps had a sign at the entrance Arbeit Macht Frei, literally Work Liberates.........I am looking forward in a strange way to my visit............I think it is something we should all do........so do the education authorities in England, more here. In a paragraph in my latest post that I deleted due to it wandering from subject at hand, I mentioned Hitler. Basically I said that the people are so anxious for change that all the presidential candidates are selling it. Not all change is good though. In the 1930's the Germans voted for Hitler as a change from the status quo...The rest is history. Hitler was charismatic, offered hope and provided his electorate a belief that their problems were not of their own making. The price the allies exacted from Germany following its defeat in WW1 contributed to an environment where this crazy but convincing nut could become elected. I think your country is some way from electing a Hitler. How you managed to elect another Bush is beyond comprehension. One of my enduring memories, one which will last forever, is being in the crowd in Belfast as President and First Lady Clinton arrived to switch on our Christmas lights. The feeling that such a small place of less than 500,000 people would attract the Clintons was just magical. Years later as I walked along a street in Belfast, I spotted former President Clinton, signing autographs as he finished a private visit to Belfast, this was quite special too. If you'll recall, the US Supreme Court elected him. Perhaps they had the final say but a significant number of voters, with or without hanging chads voted for Bush jnr too.